From the fall of 1997 to the following summer, I lived in a YMCA in London (the one in the picture). My band and I were given residency in part to help influence other residents. 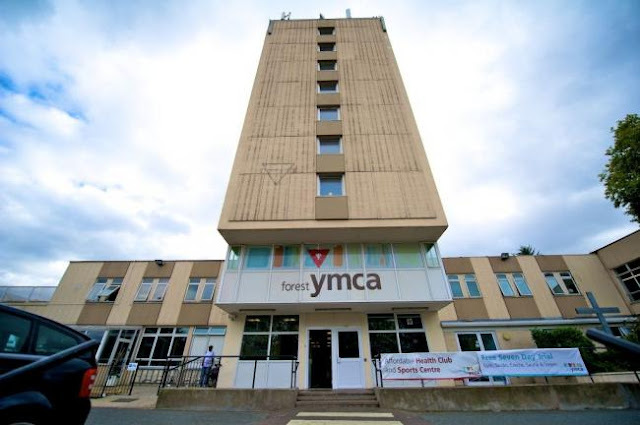 This YMCA was packed full of people struggling with life. My next door neighbor was a drug addict and an anorexic - she could only walk down the hall by leaning against the wall. Many of the residents struggled with mental health issues. One man believed that he was the actor who played Darth Vader in Star Wars. He had forged an entire collection of letters and pictures to prove it! While many we lived with had problems beyond their control, some who lived in the YMCA were criminals. They stole what they wanted and played the benefits system to their own gain. Being a band, we had lots of expensive equipment (PA system, instruments, merchandise etc.) all kept in a van. We knew that the parking lot was not a safe place to keep this stuff so we would haul the equipment to our rooms (this made our already tiny rooms even smaller). One day, before we had a chance to unload it, the van was stolen. The whole lot was gone. It was made worse by the fact that we knew full well who had stolen it and there was nothing we could do about it. Despite the best efforts of the police, there was simply no evidence to arrest the men who did it. The men who did it lived in the YMCA. They were our neighbors. One day, I remember getting into the elevator with some of them. I didn't say anything, but one of them said, "it's Robin Hood, innit?" "It's Robin Hood. You know. He took from the rich and gave to the poor." Ah, the virtue of theft! Before I could respond, he went on, "Anyway, this is a win-win situation." "Well, you have insurance, right?" "Well, then, you get new stuff and we get your old stuff"
We got out of the elevator and I left it at that. I was infuriated, but there was nothing I could do. If I made trouble with these men, I would put myself and my fellow band-members at risk. I didn't think telling the police would do any good either. The police would need more than my say-so for evidence. The most troubling thing was that these men lived very well at the Y. They may not have been rich, but they had all they needed provided for them and, if they needed more, they took it. And they couldn't care less about who they hurt in the process. Indeed, the man to whom I spoke seemed to think he had made us better off. He even felt that he was justified in stealing our stuff: "It's Robin Hood, innit?" Most of us, if we live long enough, will experience an injustice or observe a wicked action that, rather than leading to the demise of the one who commits it, leads instead to his prosperity. A criminal will get away with their evil-deed and will appear to have done well out of it. This leads many people to think that doing the right thing isn't worth it. Why bother if we can get away with doing bad things and prosper from them? This is the question the psalmist attempts to answer in Psalm 73. Is being righteous worth it if the unrighteous prosper so much from their actions? And their body is fat. The imaginations of their heart run riot. And their tongue parades through the earth. And waters of abundance are drunk by them. In effect, the psalmist says, "God is supposed to be good to the righteous but it is not the righteous who prosper but the unrighteous! Therefore, it is pointless to be holy." It was troublesome in my sight"). O Lord, when aroused, You will despise their form. Contrary to appearances, God is not benefiting the wicked. Instead, their wickedness is a slippery place, a place from which they will fall to destruction. What looks like getting away with it is, in reality, what will cause their downfall. According to the psalmist, this is true of all those who continue to practice wickedness. They are being prepared for destruction. The second reason the psalmist gives for rejecting his former view is that God’s nearness to the righteous is of such value that it outweighs all else. He concludes that this makes holiness worth all the effort and pain. The psalmist recalls his bitterness and calls such a state 'senseless.' It is senseless to think that way when God himself is worth more than all that has been lost. Instead of material benefits, it is the "nearness of God" that is his "good." Such a good is a such an overwhelming value that it takes care of his bitterness. The psalmist rejects the idea that wickedness pays off. Instead, the plight of wicked people is never good. No criminal ever ultimately gets away with it. No wicked act is ever a win-win. Instead, holiness is what wins. It may not win by providing a materially comfortable life, but the supreme value of fellowship with God is an overwhelming good that surpasses any material benefit. After we left the YMCA, I learned that one of the men who had stolen our van had been killed in a fight over drugs. Instead of thinking "serves him right", I was sad. There are few things worse than realizing that one has mistaken defeat for victory. This man would now know first hand the terror of rejecting God. I also remember that, despite their criminal behavior toward us, we really liked these people. During the year, we spent many hours talking with them. We tried to share the good news about Jesus with them. I also know the true value of a life in pursuit of a pure heart - it is life of fellowship with God and there is nothing better than that.